A geographer from the University of Southampton has been recognised for her achievements as an early career researcher with a prestigious Royal Geographical Society (RGS) award. Dr Jo Nield, an Associate Professor in Aeolian Geomorphology based in Geography and Environment at the University, has been named as the recipient of the RGS Gill Memorial Award for her early career research into aeolian processes and arid landform development. Her research focuses on furthering our understanding of the processes which help shape the surface of our earth and the way it looks – particularly the reshaping of sandy dunes or dusty dry lakes by wind in dryland environments. 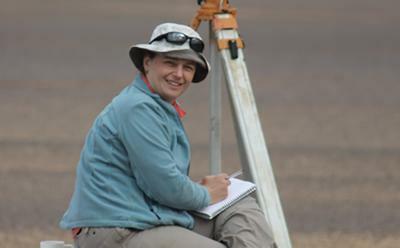 Her work has taken her to three different continents, with field sites located in Namibia and Botswana in Southern Africa, the USA and Iceland. Jo says: “I feel tremendously humbled and honoured to receive this award. I am passionate about aeolian geomorphology and really enjoy exploring interactions and feedbacks between wind and surface patterns through novel fieldwork and computer simulation modelling. The RGS annual Medals and Awards recognise excellence in geographical research, fieldwork, teaching and public engagement, and are presented to those who have made outstanding achievements in the sphere of the discipline. The Gill Memorial award encourages geographical research in academics who have shown great potential. Jo will be presented with the award certificate by the Society’s President Nicolas Crane at a Medals and Awards Celebration Day at the Royal Geographical Society in Kensington, London on Monday 6 June 2016.